Trace the geography of coffee by mimicking our Geography of a Pencil activity. 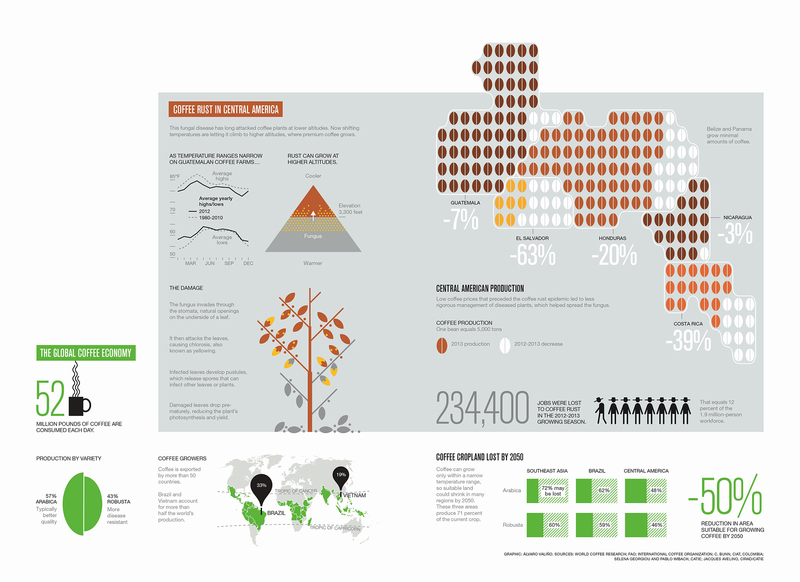 Click to enlarge this lovely graphic about the economics of the global coffee industry. 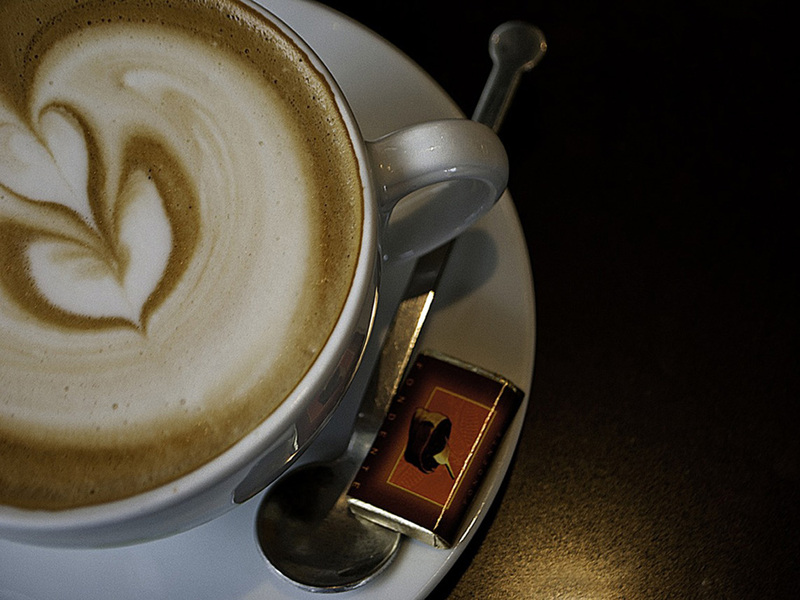 Specialty coffee is judged by its quality, not price. The NPR story outlines a supply chain that starts in the highlands of Guatemala and ends in a high-end coffee shop in the United States. Using our MapMaker Interactive, have students trace the supply chain from Huehuetenango (pronounced way-way-tehn-ANG-oh), Guatemala; to Guatemala City; to Los Angeles, California; to Portland, Oregon. What transportation methods are used in the supply chain? hiking. Workers must climb into the “tip-top of the mountain” to retrieve the most high-quality coffee beans. walking. Each bag is carried down the hill to a weighing station. truck. Bags of coffee are driven from the Huehuetenango processing plant to another one in Guatemala City. ship. Boatloads of coffee are transported up the Pacific coast to the Port of Los Angeles. rail. At the port, rail cars are filled with bags of coffee and shipped to Portland. vehicle. From the rail yards, a vehicle takes bags of coffee to roasters and retailers (coffee shops). Read our activity Geography of a Pencil. It focuses on transportation. Can students think of other transportation methods the coffee supply chain could use? Why do students think alternate methods were not chosen? by foot. This method would take too long, and not be able to transport a large quantity of coffee from Guatemala to the U.S.
by vehicle. This method would take too long, and not be able to transport a large quantity of coffee from Guatemala to the U.S.
by ship from Guatemala directly to Portland. The entire shipment of coffee does not go to Portland. Los Angeles is a much larger port, and offers distribution networks (called intermodal transport) to other cities in California, as well as all neighboring states. by air. Coffee is sometimes transported by cargo plane, although this method can be expensive. Following the supply chain, can students identify some of the jobs associated with just one cup of coffee? This business case study groups workers as growers, intermediaries, processors, government agencies, exporters, dealers/brokers, roasters, and retailers. The NPR story focuses on the end points of the supply chain, the growers on one end and roasters/retailers on the other. Read our activity A Supply Chain. The activity lists four “key stages” in a supply chain: supply, manufacturing, distribution, and consumption. Can students identify where each of these key stages takes place in the specialty coffee supply chain? manufacturing: Huehuetenango. Students may also identify the roasters in Portland as part of the manufacturing process. distribution: Guatemala City and Los Angeles. Students may also identify the entire West Coast—from Guatemala to Los Angeles—as a distribution channel. The interior of California and Oregon, where the coffee is shipped, is part of the distribution network as well. The coffee shops of Portland may also be considered part of the distribution network. Each key stage in a supply chain can be influenced by both physical geography and human geography. Can students identify some of these factors that may influence each of the key stages in the specialty coffee supply chain? physical geography: Droughts, floods, or other natural hazards in Huehuetenango would reduce the supply of coffee beans. human geography: A new farm owner may change the process and prices associated with farming in Huehuetenango. physical geography: Droughts, floods, or other natural hazards in Huehuetenango would slow the manufacturing process associated with coffee beans. human geography: Workers in Huehuetenango may organize and strike for better working conditions, such as improved on-the-job safety or increased wages. This would slow or even halt the manufacturing process. physical geography: Landslides, floods, or other natural hazards may interrupt the transport of goods from Huehuetenango to Guatemala City. These hazards may force the distributor to delay the transportation, halt it entirely, or find an alternate distribution network. Storms, rogue waves, or other oceanic hazards may delay or even prevent the shipment of goods from Guatemala to the United States. human geography: The engineering and infrastructure associated with ships, railways, and roads may be unreliable. Mechanical difficulties may delay, halt, or force the distributor to find an alternate distribution network. physical geography: Storms or other weather phenomena may reduce the number of coffee shop customers in Portland. human geography: Portland may experience a population swell or decline, which would probably increase or decrease the number of coffee-shop customers in the area. Consumers may also simply switch their taste, and drink tea instead! thank you for your research. It’s very useful for me. I’m vietnamese and my country is the No.1 Robusta coffee exporters in global.